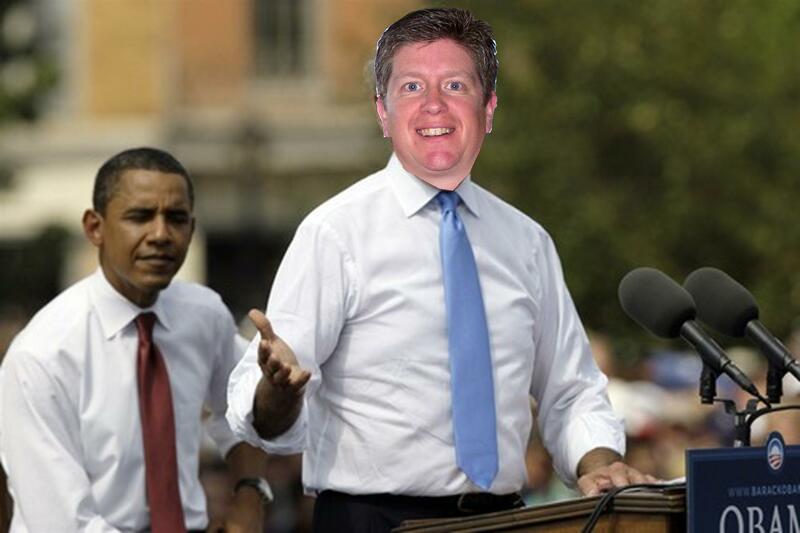 Here I am in 2008, stumping with the President-to-be. When then-candidate-Obama asked me to lend my name to his campaign in 2008, I was a little nervous but also very honored. I stood on stage beside the likes of Oprah and George Clooney. George and I became pretty close after a couple late nights in the bar. At one point he pretended to be me and I pretended to be him. It was uncanny how much we looked alike. Soon the nerves were calmed as I made speech after speech, extolling the great attributes of this great land and encouraging the masses to vote for Change, reach for Hope. I traveled across the highways and byways of this country we love. There were long hours, sure. There were greasy meals served at greasy diners. There were pot-luck dinners and home-made pies. There were babies to kiss and hands to shake at every little hamlet and village from north to south, and east to west. Unfortunately, my busy writing schedule and the importance of my Chicken Cooking Experiment made it impossible for me to travel with my friend this past year. Oh, I threw a few dollars his way and made a couple of calls but he’s surrounded himself with a new, fresh group of supporters including George Takei and Will Smith. Of course, Clooney is still a “hanger-on” and someday we hope he steps out of our shadows makes something of himself. But today, four years later, THIS day is about the President. It isn’t about the man, Barack Obama. This day is about the Presidency. This day is about the democratic process and the knowledge that our privilege to vote, our ability to make our voices heard, our right to make our mark and choose our elected officials, is still alive and well in this great Nation. You may have voted for the other guy. And that’s okay. If he were standing there with his hand on the Bible, we would all stop and say a prayer for wisdom and success as he led our nation. And that’s what I ask of you today. As this President takes office, say a prayer that he might have wisdom. Say a prayer that he will have success. I know on that cold hour in our Nation’s Capital, I will lift both a prayer and a cold one to my President, my friend. May God give him strength to lead, wisdom to make right choices, and a heart for the people of this land. AMEN. You are so awesome, Curt! Great story!